This lovely photo appeared today in my flickr stream. The very dear Anahata Katkin posted this after finding hers at Pearl River in NYC! 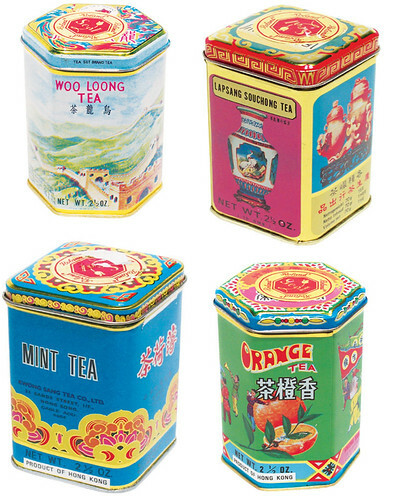 Anahata was looking for tea tins too. I just mentioned Pearl River in January when a reader wrote in looking for Chinese lanterns so I'm not sure why I didn't think of them as a resource. This is why we all need our web friends. 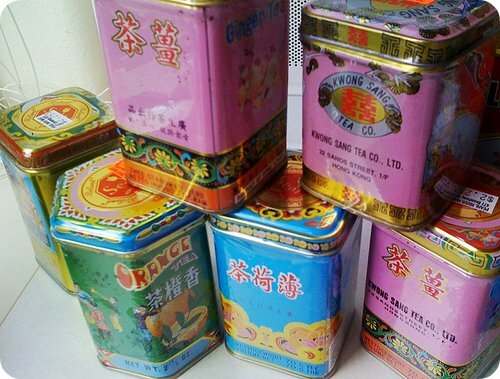 The best part about the tins Anahata found is that they are exactly what I wanted, are priced under $3 each, and they'll ship 'em to me so I don't have to drive down to Chinatown in New York. Not that I mind but it's super convenient to shop them online. Anahata thank you! Outside of storing your tea in them, you can also store office supplies or use them for q-tips and cotton balls in the bathroom. I like to use them as vases but tea tins tend to leak so I always place fresh flowers in a juice glass and then conceal the glass inside of the tin allowing for the flowers to peek out. OR If you are feeling crafty, try Lilac Moon's recycling project. 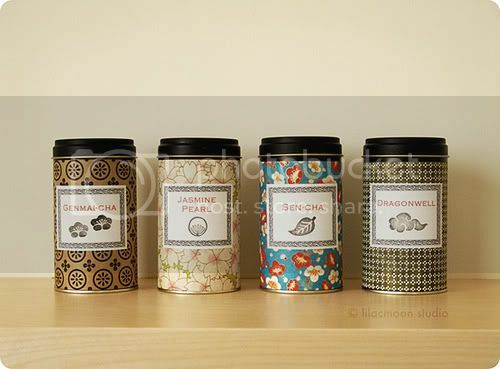 She took tea tins that would have otherwise landed in the trash and taking pretty papers and handmade stickers with stamped images, she designed her own tea tins. How clever, inexpensive, and easy! You can view more photos of this project here. Oh, and here's a link to her blog and etsy shop. Thank goodness for our web friends and all of the constant sharing that takes place.